Rhapsody on the Blue: Sailors or Divers? When you are diving you generally pick a spot to dive, head to it and do your dive(s). This can take anywhere from 3-6 hours, or more, and it does not leave a lot of time for sailing except perhaps to sail to your anchorage, or your next dive site. This trip, for us, it was compounded by the fact that while we own much of our own Scuba gear, we do not own tanks nor do we have a compressor to refill the tanks. We rented tanks for two weeks and had a glorious time diving during that time span. We just didn't do much sailing then. We wanted to use the tanks while we had them, and after you use them you have to get them refilled, so we had to plan our travels and our dives around good dive sites, and dive shops with compressors. I felt a twinge of sadness when we returned the tanks because I knew that would be the end of diving for this trip. 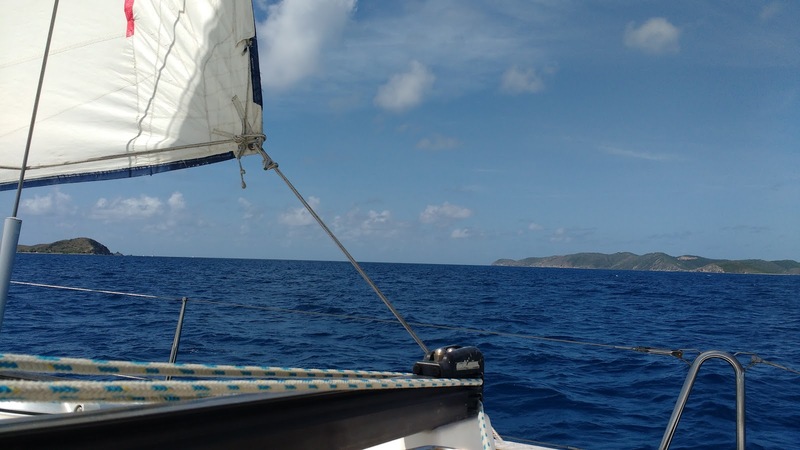 But, the end of diving meant return to sailing, and we have had some beautiful sailing days here. Every time we head out we are learning more and becoming better sailors, and there are very few things I like better than learning new things. Lesson learned - we need our own tanks and our own compressor on the boat. This will allow us to dive when we find the good spots, or just feel like diving, and not feel that we HAVE to dive because we rented the gear. Dive when we want, sail when we want. It makes me smile just thinking about it. Thanks Kim. It makes me smile too! Retirement is good, you should try it! Or at least a taste of it when you visit us. I like to share them. And it is fun to know who I am sharing them with. Thanks for leaving a comment.